In our summer 2013 educational series on paint and color technology, we begin with a review of one of the basics – what's in paint. The variety of paint products offered can be overwhelming. And with each variety of paint offering different properties that affect the outcome of a design project, understanding what's in a can of paint is key to success. Pigments are finely ground particles that are dispensed into paint and provide color and hiding properties. There are two primary types of pigment - prime pigments and extender pigments. Prime pigments are those that contribute to both wet and dry hide in paint. Titanium dioxide (TiO2 ) is the most costly pigment and it contributes directly to a paint's wet hide, while providing whiteness Colorants are prime pigments that provide the actual color within the can. There are two main types - organic and inorganic. Organic colorants provide the brighter colors, and examples of these pigments include hansa yellow and phthalo blue. These are not very durable for exterior paint application. 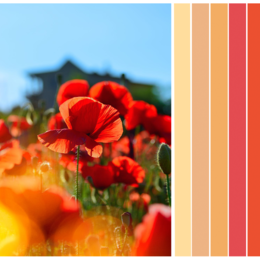 Inorganic colorants are the duller, earthy colors and are more durable for exterior paint application. 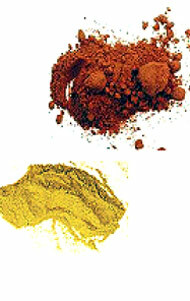 Examples of these kinds of pigments include red oxide, yellow ochre and umber. Extender pigments are lower cost pigments that give extra weight or bulk to the paint. These types of pigments contribute only to a paints dry hide, but are necessary in order to control gloss. Some extender pigments also provide additional film performance in the areas of scrub or abrasion resistance. Commonly used extenders include clay, silica, diatomaceous silica, calcium carbonate, talc and zinc oxide. Clay: Used mainly in interior paints, clay provides hiding power. Silica: Provides enhanced durability in exterior paints as well as scrub and abrasion resistance. Diatomaceous silica: Consisting of fossilized organisms, this form of silica is used to control sheen levels. 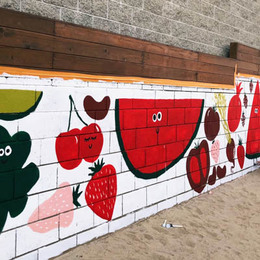 Calcium Carbonate: Used in both interior and exterior paints, calcium carbonate, also called chalk, is a general purpose, low cost, low hide pigment. 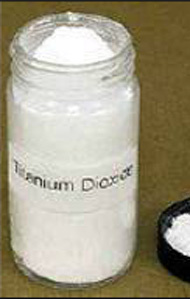 Talc: Also called magnesium silicate, talc is a soft, general purpose extender pigment. Zinc oxide: Used primarily in primers and exterior paints, zinc oxide provides mildew resistance, corrosion inhibition and stain blocking support. Binders are ingredients that provide a binding effect that holds the pigments together to create a dry film on the surface. A paints binder is the key ingredient that directly relates to a paints performance, including adhesion,, washability, scrub resistance, fade resistance or gloss retention. 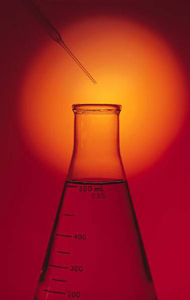 Alkyd (oil) based binders are made from various oil derivatives such as linseed oil, tung oil, and soya oil. 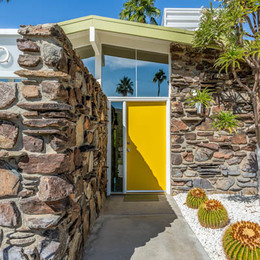 Traditional alkyd paints dry to a very hard finish and provide superior adhesion and flow and leveling; however, they will yellow in light colors and are prone to oxidation and chalking when used on exterior surfaces. As technology and VOC restrictions have changed over the years, fewer paints today are made with traditional alkyd binders. A newer technology based on modified oil binders is available; alkyd emulsion.. This type of hybrid binder gives you oil-like performance with the ease of soap and water clean-up. Alkyd-emulsion paints dry harder, flow more smoothly than typical latex paints; however, they may still yellow in lighter colors. If used on exterior surfaces subjected to UV exposure, alkyd-emulsion paints may eventually oxidize, and chalk over time. Latex binders are used in water-based paints. There are various types of latex binders available, such as 100% acrylic, styrene acrylic or vinyl acrylic, each providing specific performance characteristics. 100% Acrylic binders: often used in exterior paints as the benefits include adhesion (both wet and dry), fade resistance, alkali and efflorescence resistance. 100% acrylic binders are typically regarded as the best overall performing. Adhesion under wet conditions allow for greater performance in blister, cracking and peeling resistance. UV fade resistance allows the painted surface to retain its color and sheen longer. Alkali resistance means the paint is less likely to “burn" over fresh concrete or masonry. Vinyl acrylic, also called PVA, binders: often used in interior paints as the benefits include scrub resistance and washability. 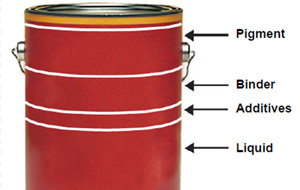 Solvents, or liquids, are the vehicle for allowing paint to get from the can to the surfaces and these types of liquids differ depending on the type of paint. Combining the pigments and binders, considered solids, with the liquids, creates the paint coating you see in the paint can. Oil-based and alkyd paints: the liquid is typically paint thinner or other type of solvent. Latex paints: the liquid is primarily water. Higher-quality paints allow for more solids, typically 35-40%, depending on gloss level. 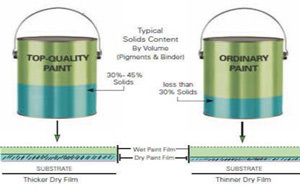 Solids by volume indicate how much paint will remain on the surface after the liquids have evaporated. 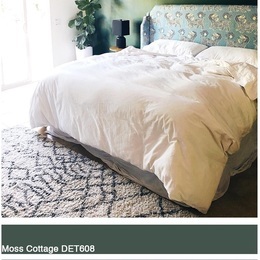 The overall paint performance is directly attributable to the make-up of the solids. Just because a paint has high solids by volume does not always translate to a high quality product..
All four ingredients are key to creating the foundation for a top-quality paint. Happy painting!